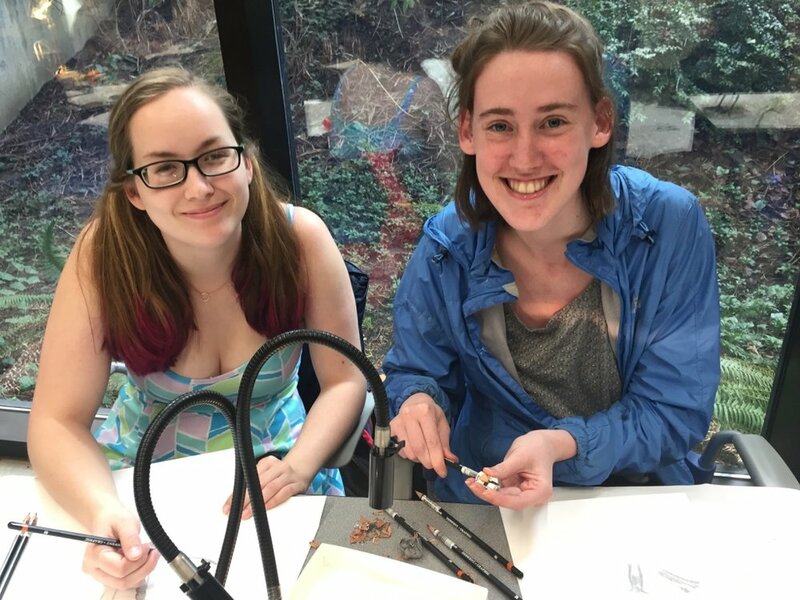 One day, a library scientist who I'd met at a museum a few months earlier called me up and asked if I wanted her and her students at Lewis & Clark College to apply for a grant so that I could be paid to hang out in Portland, drawing pinned insects with college students. A few weeks later I was heading south down the Puget Sound for an all-weekend science illustration extravaganza. After leading a discussion about science illustration history on Friday night, we had graphite and ink workshops on Saturday and Sunday. We used specimens from the collections to make detailed studies and practiced gestural, contour, and simple-shape drawing in the gardens. The weekend culminated in a pop-up exhibit in the library showcasing the students' illustrations and the too-seldom-seen natural history collections. The students and I worked together to make labels explaining the workshop. Here are some photos of the final results.